Stamps/Images: Kort og Godt Stempel S-142 (flourish text stamps). Kaisercraft Clear Texture Stamps 'Tic Toc' and 'Keys'. Lazar StudioWERX Inc rubberstamp 'Funky Holidays' (swirl). North Star Stamps CS 'snøskuter' (=snowmobile). Digital: Heart and photomask from Createwings Designs kits 'Re-Creation 23 Add-On', and 'Creation C23 Bundle - This Moment'. And frame from 'Boyhood and Tomboy Bundle' w. MLE Card Designs. Papers: Bazzill, Core'dinations cardstocks, and Canson Montvale watercolor paper. 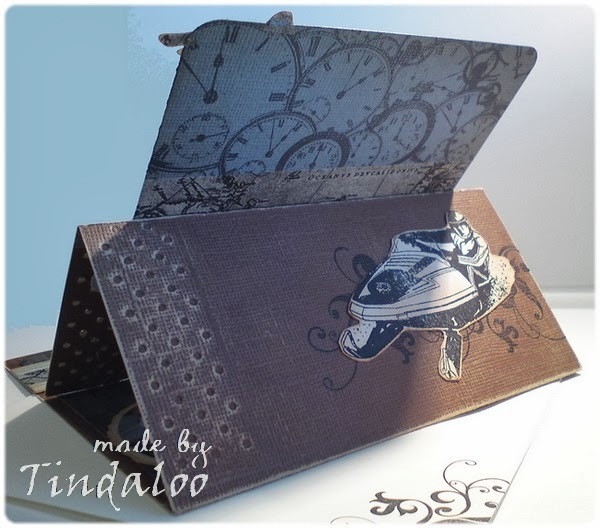 Panduro Hobby 'Tilda Country Escape Paper Pad'. Embellishments/Tools: QuicKutz (Lifestyle Crafts) 'Storybook 4x8 Mini Alphabet', 'Dove RS-0085 retired'. Spellbinder Nestabilities 'Labels One S4161', 'Oval Classic Scallop Large S4111', 'Petite Scalloped Circle Large S4115' and 'Labels 4 S4190'. Tim Holtz® 'Steampunk' Texture Fades Embossing Folder. Cuttlebug Embossing Folder Border Sets 'Just My Type'. Kremmerhuset Washi tape 'Daily like'. Panduro Hobby Washi tape 'kartor/maps'. Corner Adorner Medium Round Punch. 3D foam. I used both sandpapers and Tim Holtz Distress Ink pads to distress images and papers. Here are my two winners of the Gorjuss blogcandy! Numbers 8 & 13 were chosen out of the 14 entries, via random.org. Yey! You may choose the stamp you wish to receive! Congratulations! 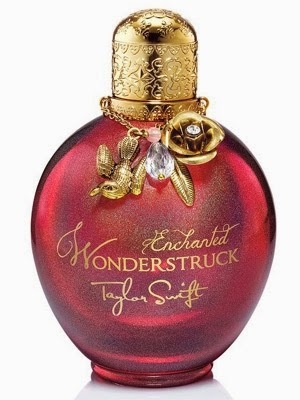 Please email me with your address ~ and mark the subject with blogcandy winner. My contact info is on my 'About me' page! Stamps/Images: La Pashe 'the Big One' Decoupage CD-rom. Wrapping paper teddybear. Christmas tree from Createwings Designs 'Festive & Bright Kit'. North Star Stamps christmas sentiment. Kort & Godt M-130 Julestempel tekst. Papers: Bazzill cardstock. Photo paper. Embellishments/Tools: Tim Holtz Sizzix Big Shot Die 'Tags And Bookplates'. Cuttlebug A2 Embossing folder 'Snow Flakes'. Sizzix Texture Impressions A2 emb. folder 'Gingerbread Man'. Collall Photo Glue. Red glitterglue from Amos. Kort og Godt ribbon. Nille red/white twine. EK Success Inverted corner punch. Unknown blue metallic brads. I used Tim Holtz Distress Ink pads to distress image and papers. 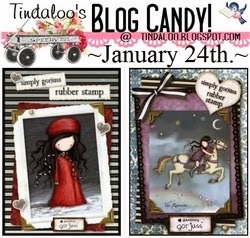 Stamps/Images: Scrapper's Delight 'Alina Fairy'. PaperArtsy - Cat's Meow 'Fairy'. Stämpelboden 'Älvsiluette 1 & 2, Slända 2'. Soul Expression 'Venn 1'. Magnolia 'BakgrundsSwirl Bröllup'. Unknown bumblebee stamp. 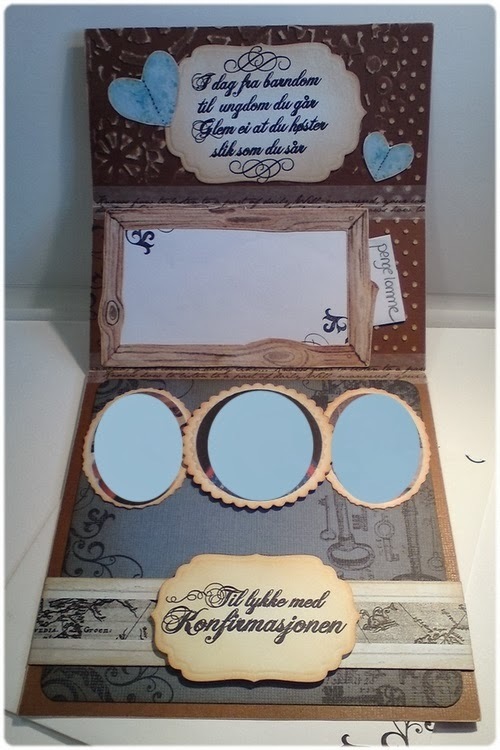 Hero Arts - Sizzix Framelits Die & Stamp Set 'Frames w Sprigs'. Kreativ Hobby 'Ønsker deg en MAGISK dag'. Papers: Bazzill cardstock. Sandylion 'Tinkerbell' coll. papers. Prima Marketing Inc. journaling notes. Base cardstock is possibly from Making Memories. Panduro Hobby - Basic Pattern paper 'Cream heart'. Embellishments/Tools: Marvy Uchida punch 'corner rounder small 1'. Lifestyle Crafts/Quickutz 'Nesting Lace Squares DC0158'. Glitz Design Rhinestone stickers. Sandylion 'Tinkerbell' coll. stickers. Har alltid elsket å lese tegneserier, og mye var fra Marvel og DC. comics da, som WonderWoman. Men tilbake til DT-kortet mitt! Fikk denne stilige Wonder Woman digi'en fra ukens sponsor Sassy Studio Designs ♥ hos Creative Fingers. ~ Lag akkurat hva du vil for #18. om du vil være med! :) Klarte faktisk å ødelegge den første superdama da jeg skulle montere! Rev av armen hennes... og måtte male en ny! Kjempeirriterende! 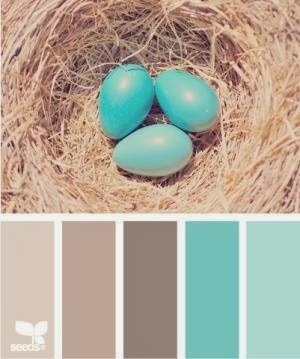 ● Open-Minded Crafting Fun #1. ~ Use New Toys or New Techniques! Stamps/Images: Sassy Studio Design 'Wonder Regan/Sassy Wonder Woman'. Amigas Del Scrap 'Super hero kit' digital elements of original WonderWoman. Papers: Bazzill cardstock. Createwings Designs papers from misc. digital kits. Embellishments/Tools: Washi tape from Nille Memories. Star eyelets unknown. Quickutz/Lifetime Crafts 'Nesting Lace Squares DC0158', 'Nesting Stars CC-5-020'. Sizzix Thinlits Die Set 'All About a Boy' & 'This & That - Charming' by Echo Park. I used Twinkling H2o's and Tim Holtz Distress Ink pads n markers to watercolor and distress image and papers.